Noble Hierarch was one of the (relatively) recent cards that I didn’t realize had become a huge deal until after it had already happened. Sure, I was fortunate to get one in one of my first boosters of Conflux – I still have her, in fact. Yes, I read a famous tournament report where someone used her and Ancient Ziggurat to power out Doran and Rafiq of the Many and attack for fourteen damage on their fourth turn. But years went by and other sets came out, and I forgot that she hadn’t been reprinted until somebody pointed me to a forum post discussing her price. Regardless of cost issues, the main upside to Noble Hierarch is that she takes the positives of one-cost mana creatures to a higher level than anyone thought possible. She lacks the evasive combat bonus of Birds of Paradise, but the key is that she can give her combat bonus to any creature, not just herself; and unlike the Birds, she contributes to combat without the need for any additional cards. Exalted is perhaps an unusually aggressive mechanic for Bant, but it is a good mechanic for the sort of decks that want to power out early creatures. A second-turn Ohran Viper or Troll Ascetic is dangerous enough; one that attacks with twice the toughness of what most colors are playing then is downright brutal. The most sought-after mana dork of recent memory, Noble Hierarch combines two simple effects into one sleek and efficient package: mana, and exalted. 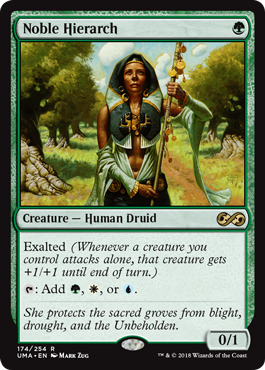 Exalted first showed up in Shards of Alara as the Bant mechanic, empowering solo attackers. So it makes sense that Noble Hierarch produces the three colors of Bant when it taps. The value of Hierarch is in being a mana dork with added utility, and exalted is a mechanic that proves useful in many scenarios. Going from one mana to three mana on turn two and giving that three-drop added pop is a good way to grind out early wins…and, of course, a deck like Infect can use every point of power it can lay its grubby mitts on. It shines brightest in faster decks, but it can help you in a war of attrition against any deck if need be. Just be wary of that 1 toughness; it’s a prime target for any burn spell, and most savvy players will eviscerate the Hierarch as soon as they have a chance to.